The town of Tequisquiapan is an excellent place for geographers! For one thing, it has a monument claiming to be The geographic center of Mexico. While this is hotly disputed, it is a fun place to start! 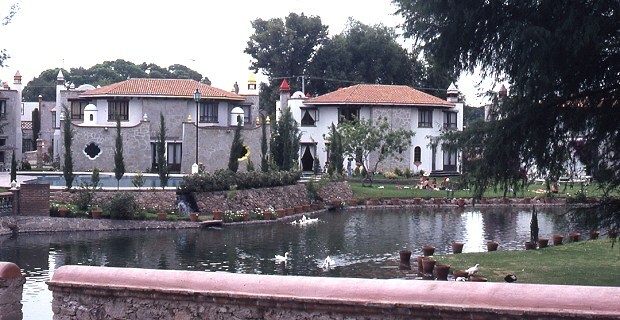 Tequisquiapan is an attractive spa town which has many hotels, restaurants and stores. It has grown substantially in recent years, attracting former Mexico City dwellers tired of the traffic congestion, smog and challenges of living in the big city. Mid-week, Tequisquiapan is largely deserted, with the air of a ghost town, waiting for revival. Revival occurs every weekend as the wealthier residents of Mexico City flee the city in search of clean air and blue skies. The town’s restaurants begin to fill and the discos gear up for action lasting into the early hours. 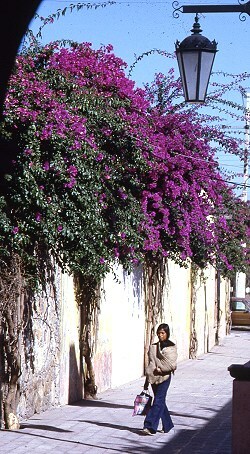 Many of the weekenders now own second homes in Tequisquiapan. 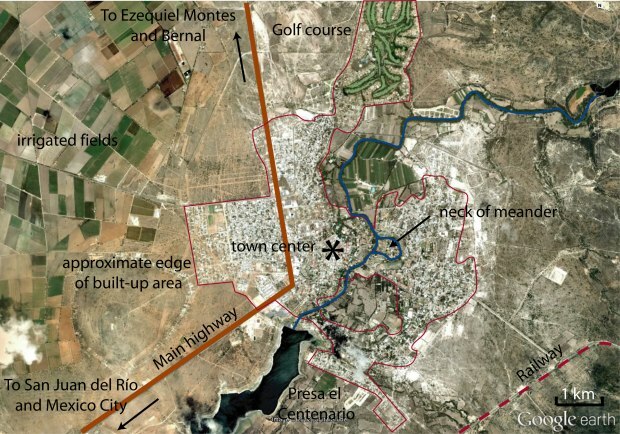 Anyone interested in urban geography will find that Tequisquiapan’s layout is quite unusual (for Mexico). Some streets in the center of the town wander aimlessly rather than conforming to the traditional Mexican grid pattern. By way of comparison, a newer area of settlement across the highway (see image above) exhibits perfect grid pattern. Behind the stone walls of the many fine hotels, the spa waters of Tequisquiapan offer their temptation. Why hike the streets when you can laze by a pool? The water is tepid rather than hot but very welcome, given the arid heat that envelops this area most of the year. Towards the south-east, the town has grown around existing farmland, so homes surround an undeveloped core of agricultural land. To the north, a former hacienda (Hacienda Grande) has been converted into a residential area built around a golf course. The irrigated fairways are strikingly visible on Google Earth. Tequisquiapan is one of the few Mexican towns of its size and age to have a gated community in the downtown core, immediately off the main plaza. Physical geographers won’t be disappointed either. Also near the center, upmarket houses have been built on the neck of a cut-off meander which has left an “island” with the river on either side. Floods on this river are now unlikely since it is controlled by the Centenario dam which has created a reservoir, Presa el Centenario, used for water sports. The flat valley floor around Tequisquiapan has become a rich farming area, particularly well known for its vineyards. A network of aqueducts and irrigation channels helps farmers overcome the vagaries of the annual dry season. The fact that this area has a pronounced dry season means that most local streams are intermittent; they run only for short periods during and immediately after the rainy season. The rest of the year, their channels are dry, providing a perfect opportunity for physical geographers to walk along them studying their features and landforms, without even getting their feet wet! On balance, given all these points of geographical interest, maybe Tequisquiapan is right to call itself the “geographic center” of Mexico after all!